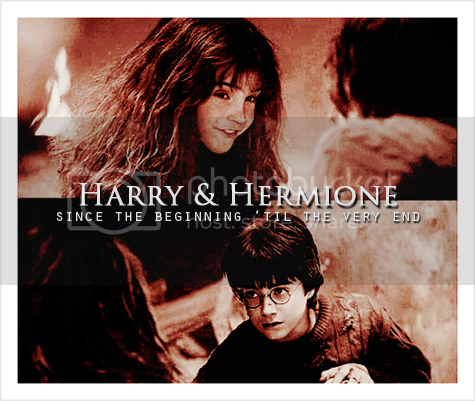 After watching DH1 three times, loving all the harmony scenes -especially the dance- I felt more delusional than ever and very proud of it I must to say, that's why I wanted to make this: a picspam of Harry and Hermione through the years. Because they're my OTP. They have brought me the most precious thing in my life: friendship. Friendship of people from almost around the world and I feel so blessed for knowing them. "Are you really?" said Hermione. "I know all about you, of course -- I got a few extra books. for background reading, and you're in Modern Magical History and The Rise and Fall of the Dark Arts and Great Wizarding Events of the Twentieth Century. "Am I?" said Harry, feeling dazed. Hermione: Are you sure that's a real spell? Well, it's not very good, is it? I've only tried a few simple ones myself... but they've all worked for me. For example: Oculus Reparo. That's better, isn't it? Holy cricket, you' re Harry Potter! 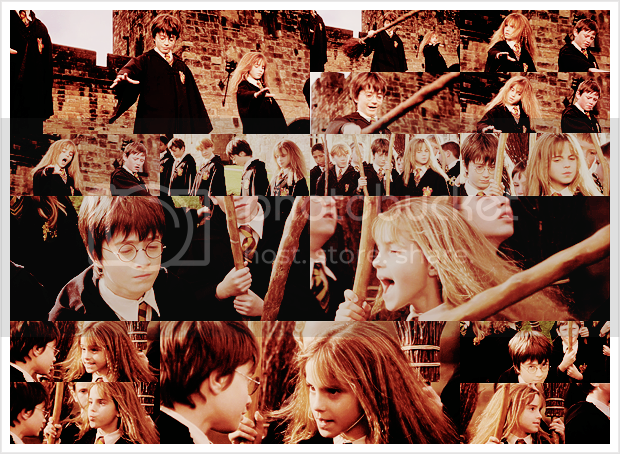 I' m Hermione Granger. ...and you will be sorted into your houses. Hermione: Oh, no. Okay, relax. Ron: Mental, that one, l' m telling you. Sorting Hat: Right, then. Right. Okay. Gryffindor! Sorting Hat: Difficult, very difficult. Plenty of courage, I see. Not a bad mind, either. There's talent, oh, yes. And a thirst to prove yourself. But where to put you? Harry: Not Slytherin, not Slytherin! Sorting Hat: Not Slytherin, eh? Are you sure? You could be great, you know. It's all here, in your head. And Slytherin will help you on the way to greatness, no doubt about that.No? Well, if you're sure. Better be... Gryffindor! Professor Snape: Mr. Potter, our new celebrity. Tell me what would I get if I added root of asphodel to an infusion of wormwood? You don't know? Well let's try again. Where Mr. Potter would you look if I asked you to find me a bezoar? Harry: I don't know, sir. Professor Snape: And what is the difference between monkswood and wolfsbane? Harry: I don't know sir. "Give it here!" Harry yelled, but Malfoy had leapt onto his broomstick and taken off. He hadn't been lying, he could fly well. Hovering level with the topmost branches of an oak he called, "Come and get it, Potter!" "No!" shouted Hermione Granger. "Madam Hooch told us not to move -- you'll get us all into trouble." Harry: Give it here Malfoy. Draco: No, I think I'll leave it somewhere for Longbottom to find. How about on the roof? What's the matter Potter? Bit beyond you reach? 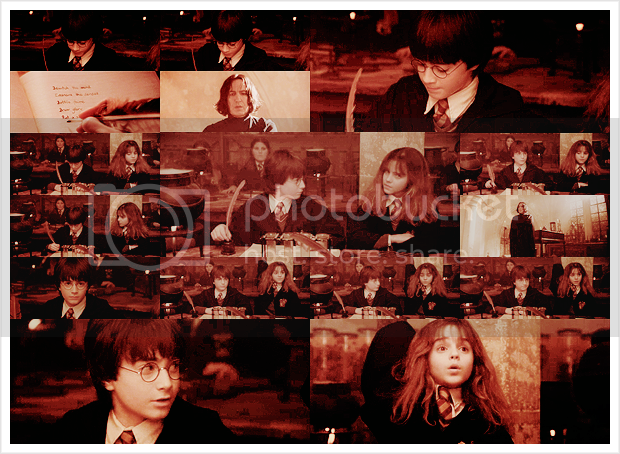 Hermione: Harry! No way! You heard what Madame Hooch said. Besides you don't even know how to fly! What an idiot! Professor McGonagall peered sternly over her glasses at Harry. "I want to hear you're training hard, Potter, or I may change my mind about punishing you." "Your father would have been proud," she said. "He was an excellent Quidditch player himself." Harry: But I've never even played Quidditch! What if I make a fool of myself? 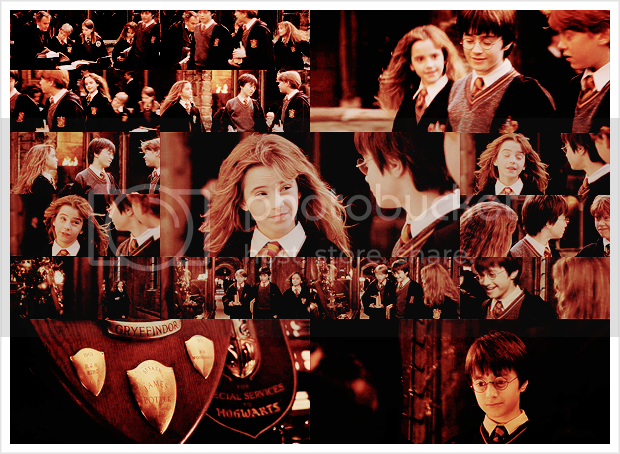 Hermione: You won't make a fool of yourself. It's in your blood. As they jostled their way through a crowd of confused Hufflepuffs, Harry suddenly grabbed Ron's arm. "I've just thought -- Hermione." "She doesn't know about the troll." Harry: How could a troll get in? Ron: Not on its own. Trolls are really stupid. Probably people playing jokes. What? 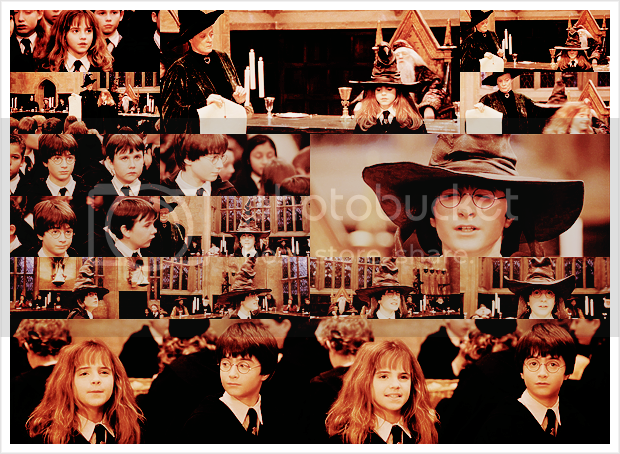 Harry: Hermione! She doesn't know. Ron: I think the troll's left the dungeon. Harry: It's going into the girls' bathroom. 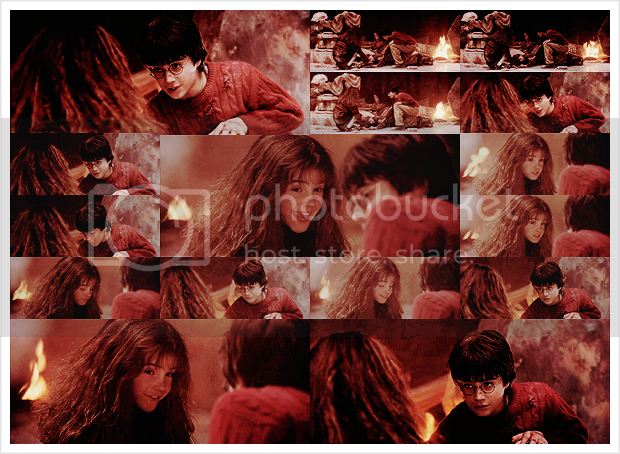 Hermione's lip trembled, and she suddenly dashed at Harry and threw her arms around him. Hermione: You’ll be okay Harry. You’re a great wizard. You really are. Harry: Not as good as you. Hermione: Me? Books! And cleverness! There are more important things. Friendship and bravery and... oh Harry, be careful! Hermione looked ready to fling her arms around him again, but Harry was glad she held herself in as his head was still very sore. "Oh, Harry, we were sure you were going to -- Dumbledore was so worried--"
"Hope you have -- er -- a good holiday," said Hermione, looking uncertainly after Uncle Vernon, shocked that anyone could be so unpleasant. "Oh, I will," said Harry, and they were surprised at the grin that was spreading over his face. "They don't know we're not allowed to use magic at home. 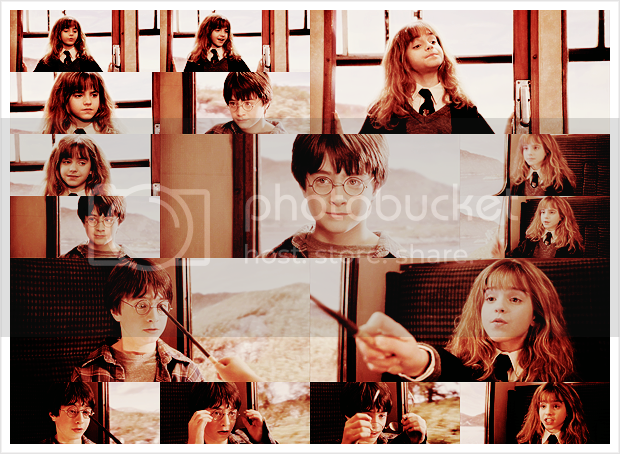 I'm going to have a lot of fun with Dudley this summer...."
Hermione: Feels strange to be going home doesn't it? Harry: I'm not going home. Not really. + Please, DO NOT repost this. I have my own Tumblr. I love them so much. They're one of my all time fave pairs of BFF's. La idea es simplemente genial, 7 picspams, desde el principio al fin. Grandes recuerdos, bellos momentos, frases y fragmentos para recordar! Me gusta mucho el color que le has dado a los screencaps. Buen trabajo, deseando ver los siguientes! En verdad es toda una suerte haberte conocido y tenerte como amiga. Y todo gracias a nuestra linda pareja. Un abrazo enorme, te quiero! Espero tener todos listos antes de que finalice este año. <3<3<3 this was great. Thanks for posting! This is one of the loveliest picspams I've ever seen! Not only are the graphics gorgeous, but I love the book/film quote comparisons. Fantastic! Awwww, they were so *cute* back then!!! Some good quotes there too. I always like the H/Hr stories that capitalise on the fact that it was *Harry* who realised that Hermione was in danger from the troll. Yeah, I love seeing images from them when they were kids. I love these two so much. Thanks for doing this! Precisamente estuve el otro día viendo "Harry Potter y la piedra filosofal", y estaba todo el rato en plan: "¡Qué pequeñines, qué guapos!". Dan es simplemente perfecto como Harry, y Emma como Hermione, es un verdadero placer haber crecido con ellos como actores/espectadores de la saga HP. Qué momentazos, por DIos. Creo que necesito ver/leer de nuevo la saga HP. Concuerdo contigo, creo que Dan y Emma nacieron para ser Harry y Hermione, no puedo imaginar a otros actores en su papel, simplemente no.